We’ve mentioned before how hosting guests with pets can be a real boon for your vacation rental business. If you’re looking for a way to stand out, allowing your renters to bring their animals along is a great way to do it. According to MoneyWise, pet-friendliness is one of the most sought-after amenities among Airbnb guests. While a quick search on Airbnb for 2 adults and “Pets allowed” (without dates specified) returns more than 300 results, other filters could potentially (and significantly) whittle that number down in your favor. If you’re just coming around to allowing furry friends to stay in your place or have been doing it for a while, we’ve got a few suggestions to help you protect your biggest asset (your home) and reap the biggest reward (your nightly rental rate). Don’t worry too much about charging pet owners a higher price than the average, pet-less guest. You’re not going to scare pet owners with fees or higher nightly rates. These are for your benefit so that if something does happen, you have the funds available to clean up or refurbish an otherwise unexpected mess. Don’t: Make your Pet Fee ridiculously high. While all of this is true, don’t go overboard. “Fair” pet fees won’t scare pet owners, but sky-high ones may cause them to look elsewhere. Do some homework by checking out nearby and similar listings that allow pets. Where are they setting their fees and nightly rates? Follow suit. Once you’ve got some solid reviews from pet owners who mention their pets in their reviews, then you can raise your rate or fee a bit more if you so choose. Your house rules for non-pet toting guests and pet owners may be slightly different, and that’s okay. Do: Ensure your expectations are clear. If you’re only allowing service animals. If you’re only inviting pets up to a certain weight. If you’re not open to hosting cats/dogs or specific animals. If you’re excluding certain breeds. If you’re requiring pets to be of a certain age (no youngsters). How pet owners should dispose of pet waste. Areas where pets shouldn’t be allowed (if applicable). Don’t: Make outrageous rules that are nearly impossible (if not straight-up impossible) for guests to follow. Be realistic in your rulemaking. For example, don’t tell pet owners that their fur babies are absolutely not allowed to potty in your yard or in the condo/apartment community – where else are they going to take them? Expect that pet owners will be responsible and pick up after their pets. Also, over time, expect to see some light damage in your home if you’re allowing pets. This is just a part of having pets. It’s not intentional by the pet owners or the pets themselves – it just happens. Think like a pet owner and then go above and beyond. People love their pets and for many, pets are like children. As such, pet owners will be interested in their pets’ comfort as much as their own. Be prepared for this. Consider leaving some special treats in your guests’ welcome packet or basket for the animals. Offer a special dog bed that you can easily wash between stays. Keep extra food and water bowls in your kitchen’s utensil lineup. Drop a few toys into a basket for pets to play with. These are all pretty easy ways to let your guests know their furry friends’ comfort is equally as important as theirs is. Don’t: Set up your home in a way that invites damage. While all the above is great, it’s also vital that you think in terms of how living with a pet changes how one sets up their home. Don’t leave decor on the floor, especially things that can be scratched or chewed. Tuck electrical cords out of sight and reach. If you have live plants, try keeping them away from pet-friendly zones. Also, avoid keeping plants that can be harmful to pets. Hosting pets might be what you need to put a new boom in your occupancy rate. By following these recommendations and steering clear of the “don’ts,” you’ll have one more way to separate yourself from the vacation rental crowd. 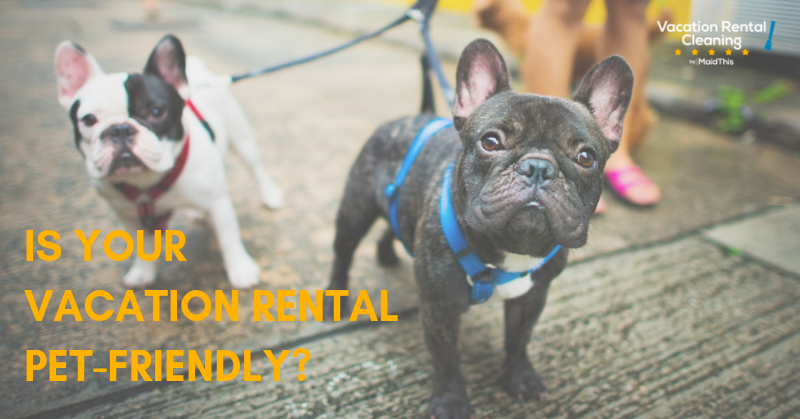 Is Your Vacation Rental Pet-Friendly?